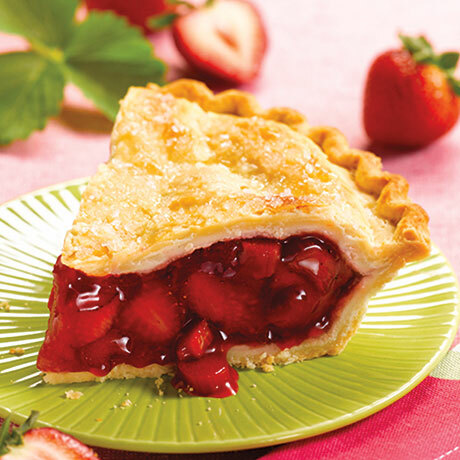 Sweet strawberries and tender, ripe rhubarb come together to create an exciting taste sensation. 10" diameter. 45 ounces. Contains Wheat, Soy and Milk. May Contain Traces of Eggs, Peanuts and/or Tree Nuts. Modified Food Starch, Corn Syrup, Salt, Butter (Cream [Milk], Salt), Dextrose, Stabilizer Blend (Corn Starch, Dextrose, Sugar, Guar Gum, Cellulose Gum, Agar), Annatto and Turmeric Extracts for Color, Calcium Propionate to retard spoilage, Sodium Benzoate (Preservative), Cellulose Gum, Artificial Flavor, Nonfat Dry Milk (Nonfat Milk, Lactose, Vitamin A, Vitamin D), Red Color (Red 40), Xanthan Gum.